Derry City forward, Ronan Curtis pictured after scoring for the Candy Stripes' U19s in the Foyle Cup Final against Altringham in 2014. Derry City’s U19 coach John Quigg believes the Hughes Insurance Foyle Cup continues to help young players find a pathway into senior football. Quigg, who has guided the likes of Barry McNamee, Conor McDermott, Rory Holden and Ronan Curtis to name but a few into the current ‘Candy Stripes’ first team, feels the Foyle Cup experience helps their development. “The Foyle Cup has been great for senior football particularly in the North West,” declared Quigg. “At the minute in the current Derry squad you have the likes of Barry McNamee, Conor McDermott, Rory Holden, Ronan Curtis, Nathan Boyle and Ben Doherty who have either played in or won the Foyle Cup with Derry City. “Then also playing senior football at the minute who played in the Foyle Cup is Patrick McEleney, Michael Duffy, (Dundalk); Ciaron Harkin, Darren McCauley, (Coleraine); David McDaid, Patrick McClean, (Waterford); Ryan Curran (Ballinamallard) and Georgie Kelly (UCD) and, to be honest, I could go on. Derry City youngsters Chris Flanagan, Ciaron Harkin (jumping) and Ronan Curtis (10) celebrate the striker's goal against Altrincham, in the 2014 Hughes Insurance Foyle Cup U19 final. Quigg feels the festival of football, which got underway yesterday, provides City youngsters with the first real taste of what it’s like playing for a club like Derry City. “It’s the same every year, all our young players can’t wait for the Foyle Cup to start and this year is no different,” he added. “For the seven, eight and nine year-olds, they dream about playing in the Foyle Cup - that’s all they think about and that’s great. “At the end of the day the tournament, which is also a massive boost financially for virtually the entire North West area from Inishowen to Newbuildings, has been fantastic for the development of all those young players. It’s the same every year, all our young players can’t wait for the Foyle Cup to start and this year is no different. 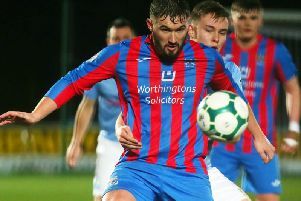 “As I said, there are quite a few players who are currently playing in Derry’s first team, but even if they don’t make it at Derry, quite a few are playing senior football elsewhere and the Foyle Cup has played a part in that. For the last two years, local junior sides Ballymoor and Foyle Harps have defeated City and Quigg also remembers the year when City’s near neighbours Finn Harps defeated them. “The Foyle Cup is the first big competition a lot of the young lads experience what it’s like to play for Derry City,” he added. “When all sides come up against Derry they raise their game, so it’s a fantastic test for our young boys, because they can’t afford to have an off game or they’ll lose. “We were put out the last two years by Ballymoor and Foyle Harps. They raise their game 100 per cent, because it’s other local players thinking that they are good enough to play for Derry City and that’s great because it lifts the bar for everybody. “Look if you are winning all the time, what are you really gaining. A defeat in a cup competition always hurts.